The Czech region of Moravia has so many medieval castles, which would require a long time to visit them all . 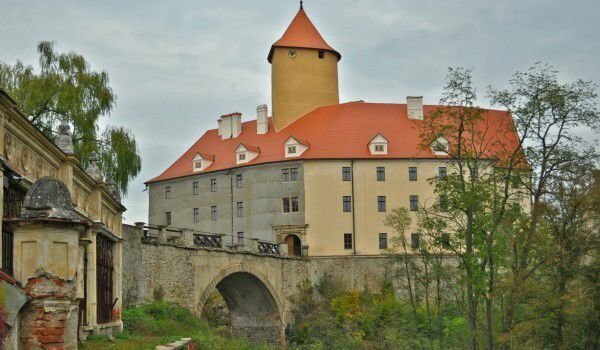 There are Bouzov Castle, Straznice Castle and the impressive medieval fortress of Veveri. Veveri Castle is considered one of the oldest and biggest in this region of the Czech Republic. It is located about 10-15 km northwest of the city of Brno, where you can visit the impressive Slavkov Castle, historically linked to the Battle of Austerlitz. Nearby is Spilberg Castle, and if you want to enjoy the natural beauty of the area, be sure to visit the Brno Dam. The history of the Veveri Castle began about 1000 years ago, when Earl Conrad built a hunting lodge. The first information about thecastle comes from 1213 and 1222, when King Přemysl Otakar II founded Veveri prison for those who dared to oppose him. In 14th century, Count Jan Indrich, who was the younger brother of Charles IV, brought significant improvements to the design of the castle, to which rear part with two high towers and outer space were built. In the centre of Veveri Castle complex remains the great hall and Chapel of St. Prokop, who later became known as St. Wenceslas. In its current architecture frameworks, the castle was rebuilt in the mid 18th century. Today Veveri Castle has become a tourist attraction and has a great interest among its many visitors. Festivals of medieval reenactments and various other musical events are organized. The castle can be reached by a tourist boat that is part of the river system in the area of Brno. You can buy a combined ticket which is valid for the boat and the castle.